It was a Saturday in November 1994 that I met Victoria Rinehart to take her and a group of her nursing students on a walking tour of the cure cottages of Saranac Lake. 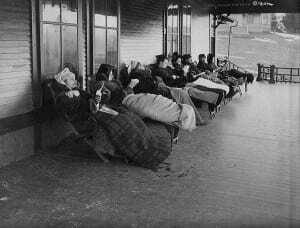 As we tramped the streets, I told her what I could about Saranac Lake’s history as America’s pioneer health resort for the treatment of tuberculosis. Not long afterward she told me of her desire to write a book about the role nurses played in that 75-year story. I wondered silently if she realized what a daunting task this might be. When I embarked on a bookwriting venture about a decade earlier, on the history and architecture of the village’s TB era, I had been quite naïve of the magnitude of the challenge; but what I heard in her voice was not naïveté. It was enthusiasm. And now she has produced a fine and important book—Portrait of Healing: Curing in the Woods. Many who have undertaken a historical book requiring extensive original research, had they known the demands to come, would have had serious doubts about ever beginning. I am glad she persevered. Her book was seven years in the making; and like mine, it appears to have grown to be about triple the originally envisioned size. Not that there is any “padding.” There isn’t. But if the story is worth telling, it is worth telling completely. Dr. Rinehart (she holds a Ph.D. in education) takes us in these pages from 17-year-old Edward Livingston Trudeau, a mid-19th-century party boy completely clueless about the tests his life was soon to bring and the role he would play in the future of medicine, to the recent 50th wedding anniversary of Lilo and Mel Levine, both survivors of the White Plague who had met and cured and courted at the Trudeau Sanatorium. 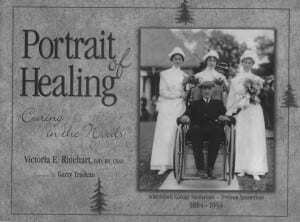 Following a gracious foreword by cartoonist Garry Trudeau, a Saranac Lake native and great-grandson of Edward Trudeau, Portrait of Healing is set largely in three long chapters. The first builds the book’s foundation and is mostly concerned with the life of Dr. Trudeau, how he became a physician, his illness and recovery from tuberculosis, and the discoveries which, beginning at Paul Smiths and continuing in Saranac Lake, led to the near-vanquishment of what had been an invincible killer. 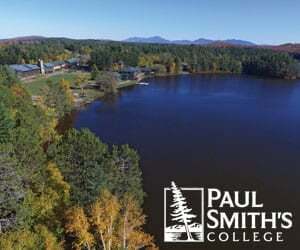 Here is the story of the evolution of the “fresh-air cure,” the “outdoor life” as a way to health, and the founding of the Adirondack Cottage Sanitarium (later renamed Trudeau Sanatorium) above the Saranac River on the east slope of Mount Pisgah. Lake while taking in the fresh air. Chapter 2 details life at Trudeau San for the physicians, nurses and especially the patients—the “students” at the “university of hope.” Aside from the biomedical research in its laboratory, the San was the locus of many innovations in tuberculosis treatment and health improvement in general. The D. Ogden Mills Training School for Nurses was the first nursing school in the nation specializing in the care of TB patients. The Trudeau School of Tuberculosis was the first such school for physicians. The birth of modern occupational therapy occurred at the San in 1904, thanks to Dr. Lawrason Brown, who founded The Journal of the Outdoor Life, a magazine devoted to the lifestyle of the fresh-air cure. Brown also wrote Rules for Recovery from Pulmonary Tuberculosis, a patients’ handbook to regaining health. These innovations not only promulgated knowledge and understanding of the disease but also emphasized the humanity of the patient. The San (not to mention the village of Saranac Lake) was a world apart, but it was not a leper colony. People came here to be healed. In the process, their lives were transformed. They were made whole. The book makes clear that what happened in Saranac Lake 75 or 100 years ago was the sort of holistic approach to healing that the medical community, after more than a half-century of romancing the pharmaceuticals industry, is only just beginning to embrace. 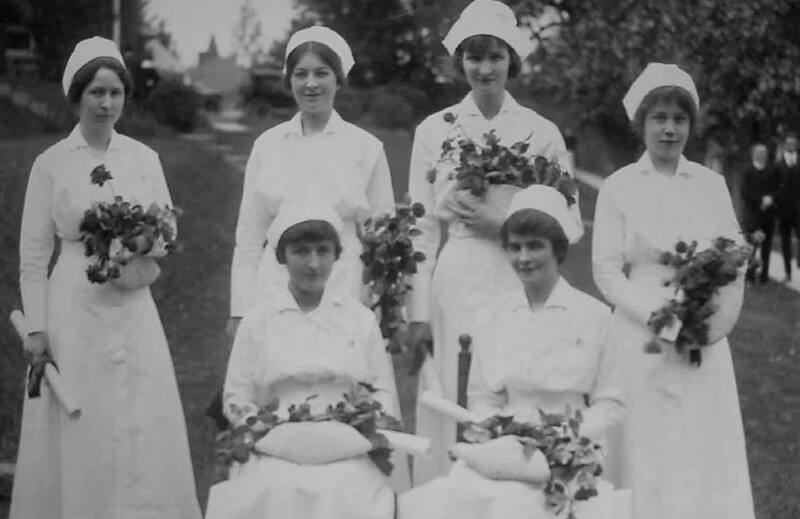 Indeed, the 1923-24 course requirements at the D. Ogden Mills Training School for Nurses included massage in the advanced nursing course. It has only been in the past decade that the therapeutic value of massage has been widely appreciated again, and now wide-eyed researchers are writing papers on how massage can help speed recovery from illness. The nurses at Trudeau knew this as a matter of fact four generations ago. Training School pose for a graduation photo in 1917. 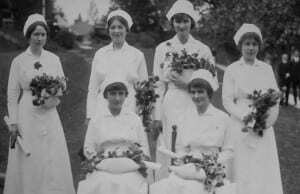 The history of nursing at Trudeau is the core of Rinehart’s book. The concept of the medically trained nurse did not begin to take hold in the United States until the last quarter of the 19th century. The first nursing school opened at Belleview in 1873. By 1879, there were 11; by the turn of the century, there were 400. The progression was similar at Trudeau. 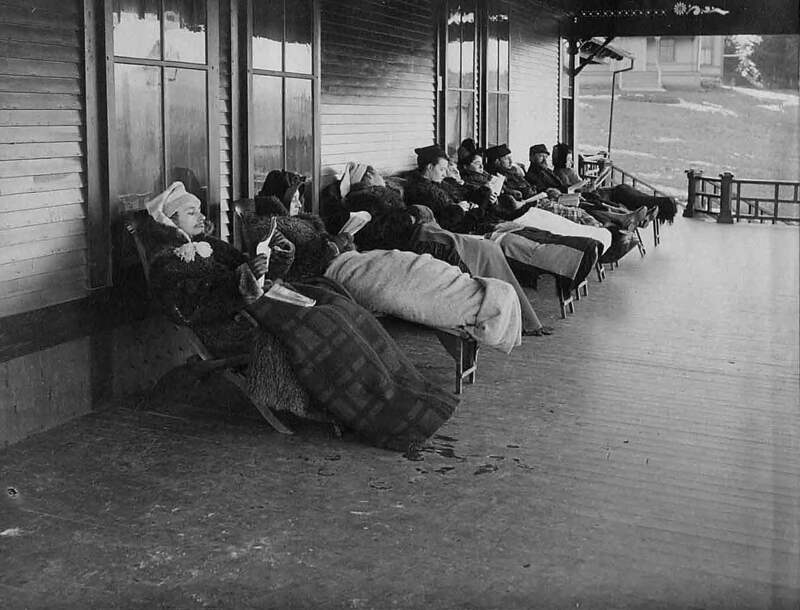 When the Adirondack Cottage Sanitarium opened in 1884, the “nurses” were guides, lumbermen and “any old woman I could get,” as Trudeau put it. By 1912, the San had opened its own training school. From Ruth Collins in 1893 to Bea Sprague Edward, who closed the San in 1954, Rinehart presents portraits of empathy, dedication, and professionalism that are as moving as they are enlightening. Rinehart builds much of her book around the words of others. She makes very liberal use of quotations, and two entire subchapters are patient/nurse’s reminiscences. The latter of these, “The Story of Lilo,” is my favorite part—made more delightful in that I have had the privilege to see this remarkable woman and her husband, Mel Levine, living their lives in and contributing to their adopted village 52 years after they met at the San. Rinehart, an associate professor of nursing, had access to the Trudeau Institute archives, where she obtained written documents and a treasure trove of photographs, scores of which enliven her book. Some of these images were reproduced from scans of half-tone originals, but they are remarkably crisp nonetheless. Outstanding are the hand-colored scenes and portraits from what must have been Trudeau’s personal albums. My favorite is a shot of him iceskating with Robert Louis Stevenson and another man on Moody Pond in the winter of 1887-88. If there is anything about Portrait of Healing that troubles me, it is that there are quite a few basic grammatical and stylistic errors, little obstacles which can annoy the reader. Such issues of mechanics are precisely why writers have editors and proofreaders, and I believe Rinehart was not as well-served by hers as she should have been. That being said, I can still strongly recommend Portrait of Healing: Curing in the Woods as a fascinating historical journey . Trudeau Sanatorium, shown here in 1930, had grown to 58 buildings on 85 acres by 1951. Gallos is the author of Cure Cottages of Saranac Lake: Architecture and History of a Pioneer Health Resort. His maternal grandmother came to Saranac Lake for “the cure” in the late 1930s, and his mother worked as a microbiologist at the old Trudeau Lab.